ICPCN released 3 new key advocacy messages on 7 April (World Health Day) 2016 and has made a commitment to advocate for these at all levels. These messages can be downloaded in a number of languages below. 1. Access to good health care, including palliative care, is every child’s right. of paediatric formulations when appropriate. For the purposes of these messages, the term ‘child’ refers to neonates, infants, adolescents and young adults in every country of the world, including those displaced and affected by war and other humanitarian situations and ‘palliative care for children’ refers to a specialised field to be provided by healthcare workers with the relevant training and skills. 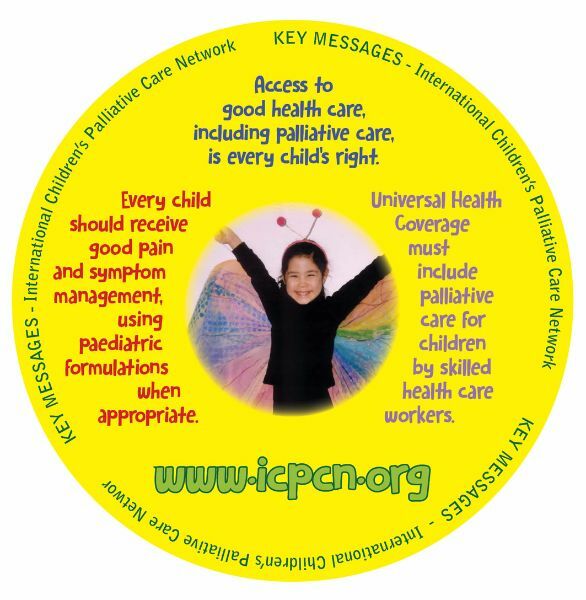 ‘The ICPCN believes that children’s palliative care is the right of any child diagnosed with a life-limiting or life-threatening illness. This belief is supported by the UN Convention on the Rights of the Child, which states that the best interest of the child should be the primary consideration in all interactions with the child. It further refers to palliative care as a component of the child’s right to health. The Human Rights Committee of the UN also recognises children’s palliative care as an obligatory part of health care services to be provided by adequately trained professionals. 2. Every child should receive good pain and symptom management, making use of paediatric formulations when appropriate. ‘Pain is the most prevalent symptom, experienced by 80% of children with cancer, 67% of those with progressive non-malignant diseases and 55% of those with HIV/AIDS. The ICPCN’s experience has shown that pain in children is often inadequately treated due to a lack of practitioner skill in assessing a child’s pain and the fear of using opioids by medical professionals working with children. Morphine is the drug of choice for treating moderate to severe pain, preferably using the oral route as it is safe and inexpensive. The WHO two-step ladder should be used as a guide and medications need to be provided in paediatric formulations. 3. Universal Health Coverage must include palliative care for children by skilled health care workers. The World Health Organization defines Universal health coverage (UHC) as access by people of all ages to the promotive, curative, rehabilitative and palliative health services they need and that these services should be affordable and of sufficient quality to be effective. We therefore call on every government to actively ensure that palliative care for children is included as an integral part of Universal health coverage.